Towing A Fifth Wheel With A Short Bed Truck. You can tow a fifth wheel trailer with a short bed truck without using a slider hitch. And it is possible for trucks with beds shorter than 6 feet to tow a fifth wheel trailer by using a Sidewinder Hitch. 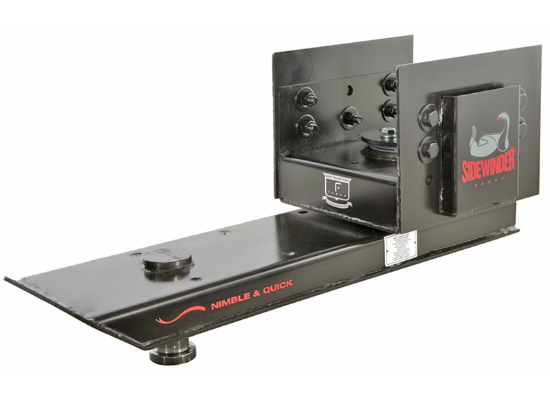 The Sidewinder replaces your normal 5th wheel hitch and extends the king pin forward of the Fifth Wheel, which moves the Fifth Wheel back toward the rear of the trucks bed. NOTE: It is not recommended to use a Sidewinder with a slider hitch. When a truck is towing with a standard king pin, the 5th wheel turns or pivots at the hitch. With the sidewinder, the pivot point is moved closer to the tailgate, creating more space in between the truck cab and trailer when making sharp turns. This extra space also provides more cargo space for things such as toolboxes which couldn't fit in the bed before, and the new pivot point makes the trailer track better behind the truck for easier towing. The Sidewinder is available in the heavy duty 19K, Standard 16K, and the Fifth Airborne Sidewinder with Air-Ride in 16K. The Fifth Airborne Sidewinder allows you to get the benefits of both the Sidewinder and Fifth Airborne Air-Ride king pin. All move the pivot point 22 inches toward the rear of the truck. Some 5th wheel campers have a front that is specially designed to work with short bed trucks. If your 5th wheel is built to be compatible with a short bed truck the information below is not relevant, as the trailer is designed to provide turning clearance for a short bed truck. Here is a formula you can use to determine if you will have enough turning clearance with your 5th wheel. Measure the distance from the center of the 5th wheel hitch head, or center of the rear axle if the truck does not have a 5th wheel hitch installed, to the back of the trucks cab. The distance needs to be 4 inches longer than 1/2 of the width of your 5th wheel camper. As an example, the distance from the center of the axle or hitch head to the back of the cab is 54 inches. Measure the trailers front end width and divide by 2. As an example let's say the 5th wheel front end is 8 feet wide (96 inches) divided by 2 = 48 inches. 54 inches minus 48 inches gives us a clearance of 6 inches which is more than the 4 inches needed, so the turning clearance is ok. If the clearance is less than 4 inches then the front of the 5th wheel is going to hit the cab when making a tight turn. To solve this problem you can install a slider hitch. Using a slider hitch will increase your turning clearance by the length of the hitch's slider. If you install a slider hitch that slides 12 inches, you would add the 12 inches to your measurement from the center of the axle to the cab. So as an example if we measure the from center of axle to cab and get 40 inches, we would add 12 inches for the slider hitch to the 40 inches for a total of 52 inches. 52 inches less half of the 5th wheel front width would give us 52 - 48 inches for a clearance of 4 inches which would be acceptable. So to sum up. There are two types of short bed hitches available. The Slider Hitch and the Sidewinder Hitch. Both move the 5th wheel back toward the tailgate and allow sharp turns without the 5th wheel hitting the cab. Before purchasing a hitch you need to take measurements to make sure you have the 4 inches of clearance needed. Below is an informative video on how a slider hitch works and the drawbacks of other types of short bed hitches.